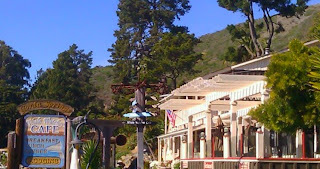 modlandUSA: Highway Robbery, Marketing, and You. Highway Robbery, Marketing, and You. 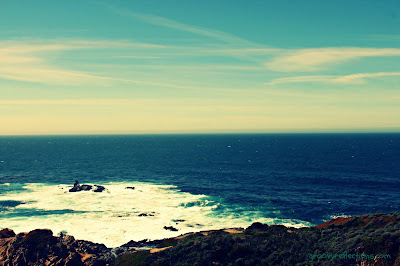 Imagine this: You’re driving down the California coast with the Pacific Ocean far below you. A most stunning view which makes it challenging to tackle all those curves on U.S. 1. You've driven for miles and need a rest, yet, there’s nothing in sight. Suddenly, there’s something just up ahead. 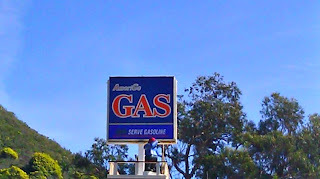 Ah...food, gas, lodging. And it looks awfully tranquil. 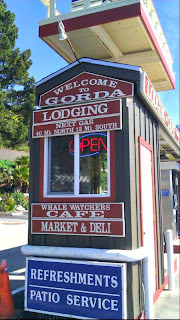 Gorda is an unincorporated area, a mere speck on the map, about 65 miles south of Carmel and 25 miles north of the Hearst Castle, according to Beach California. Population is almost nil; one source cites 10; another boasts 100. Years ago, on a previous visit to the area, I needed to refuel both myself and my car. The sandwich was decent however, shock set in when I read the gas price (which is NOT advertised in big letters anywhere...only on the pump). After fueling up with just a couple of gallons, I left with a sour taste in my mouth. Needless to say, my reaction was subtle compared to some of the folks in this article from 2008! 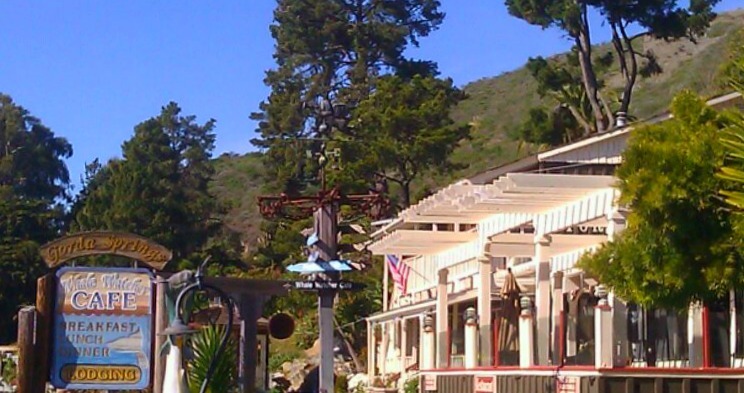 The complex consists of a dining establishment (The Whale Watchers Café), a convenience store, a llama (seriously, there’s a sign pointing to where you can find him or her), an antique shop, and a gas station. It’s all very peaceful and rustic. The food offerings all sounded delicious. I settled on a $15 appetizer that consisted of two crispy flat tortillas, each piled with lettuce, a few slices of smoked salmon with dollops of guacamole and sour cream on top. Fine for me, however, not exactly a hearty meal. Sandwiches ranged in the $15 to $20 range. Okay. You’re paying for the view, right? Despite just six people in total dining in the restaurant, service was slow and spotty. Sitting outdoors offered no shade from the strong sun; however, they do have indoor seating too. All photos were taken on March 1, 2013, including the one above. 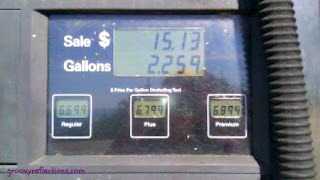 Do look closely at the price per gallon. Apparently, the last customer didn’t fill up! Is this any way to run a business? Absolutely not! What ever happened to repurchase loyalty; who is going to return? Little things such as coffee mugs and some comfort items in the room could have made a difference, as the customer further explained in their review. The owner’s investment in customer satisfaction would achieve better reviews on Yelp and other on-line review sites which is a small price to pay. Fortunately for them, not everyone does their homework beforehand! 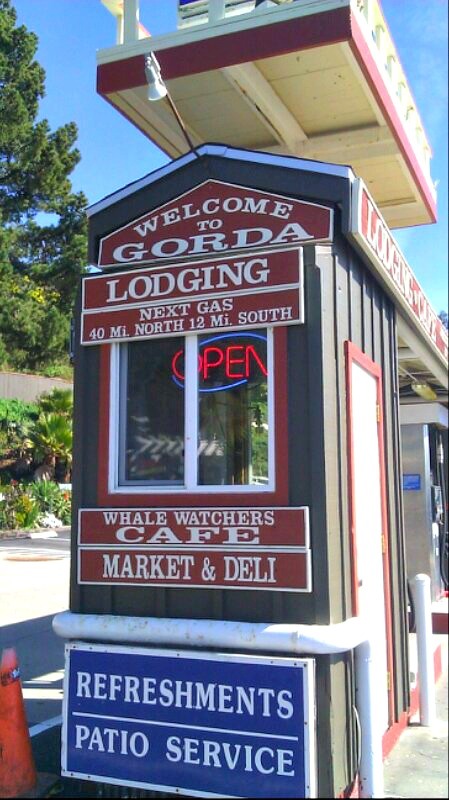 The cost of a stop in Gorda falls well below expectations whether it’s a fill up or a stay over. I did read on Wikipedia that the high price of gas at Gorda's pumps is associated with costs required to run the diesel generator for the town. Uh, what town? Joni Mitchell sang about being raised on robbery. Certainly not a good thing for the customer. However, there are good things to be found on our website, or on Twitter, Facebook, or Google+. Bad. Will not take that exit! Bannerizer made it easy for you to promote ClickBank products with banners, simply visit Bannerizer, and get the banner codes for your selected ClickBank products or use the Universal ClickBank Banner Rotator to promote all of the ClickBank products.